Five restaurants you should support while Cal is on break. Plus, a Japanese chef makes a foray into California cuisine. Summer is a good time to enjoy one of the curry plates at Muracci's Japanese Curry & Grill. A recent spur-of-the-moment visit to the UC Berkeley campus reminded me of two interrelated, if seemingly contradictory truths I hold to be self-evident. The first is how much more convenient and low-key it is to visit the area when the majority of the students are away on summer break. The second is my fear that all of my favorite restaurants near campus will suffer a precipitous drop in business during the summer months and will wind up closing altogether. Even chains aren't exempt from this danger — e.g., the now-shuttered outpost of Maoz Vegetarian, my one-time favorite free-refills fast-food falafel bar. 1. Chengdu Style Restaurant (2600 Bancroft Way) is my go-to spot for rustic, home-style Sichuan cooking — a cuisine of fiery-red hot pots and tongue-numbing spice. During my visits, the restaurant has been patronized almost exclusively by Chinese international students, and it's easy to see why: The food is priced to suit a student budget, and dishes such as the flour-steamed pork ribs and spicy "water-boiled" fish pack a big flavor wallop, and are perfect for family-style dining. If you're a fan of the Sichuan peppercorn (the citrusy spice that creates the cuisine's characteristic numbing effect), let your server know — that way the kitchen will know that it has permission to hit you with the full dose. 3. If curry is what you crave, you won't do much better than Muracci's Japanese Curry & Grill (2428 Telegraph Ave.), the Berkeley outpost of a family-run San Francisco-based mini-chain. 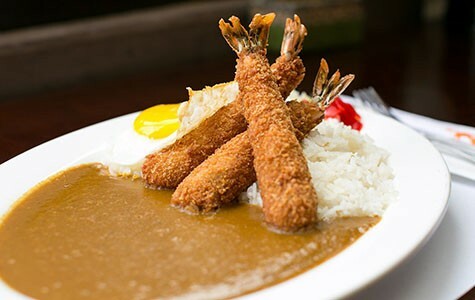 The restaurant's scratch-made curry sauce is a perfect complement to batter-fried meat and heaping mounds of white rice. While some might consider a sweat-inducing bowl of curry to be cold-weather fare, I view it as pure comfort food, any time of year. 4. Home to the massive, Hollandaise-topped savory French toast sandwich known as the "Alameda," Sunny Side Cafe (2136 Oxford St.) is a popular spot among students as well as families with kids. On weekends in particular, the list of seasonal specials — often including even more decadent versions of the Alameda — is worth checking out. 5. Okay, so Great China (2190 Bancroft Way) — arguably the most popular Chinese restaurant in Berkeley — probably isn't hurting for business, summer break or not. Still, for diners who are averse to long waits, this is a good time to visit when the Northern Chinese specialist is less crowded — especially if you can make it over for weekday lunch. The Peking duck is the showstopper, but I'm also a fan of the fried baby clams and the steamed buns with sautéed Dungeness crab (if you can catch it before the season is over). Iyasare chef-owner Shotaro Kamio is known for serving some of the most gorgeous — and tastiest — Japanese food in Berkeley. Now, as Inside Scoop first reported, Kamio has taken over Zut! on Fourth (1820 Fourth St.), located just a few steps away from his inaugural restaurant. What Iyasare devotees might not expect is that the new restaurant — which will be rebranded, only slightly, as Zut Tavern — won't serve Japanese fare at all, but rather European-influenced California cuisine. When reached by phone earlier this week, Kamio told me that when he first started out as a chef in Japan, he had specialized in what was known broadly in his country as "international cuisine," which included French, Italian, and German dishes. At Zut Tavern, he'll draw on that background, as well as on the past fifteen years he has spent in California, during which time he has become a devotee of local, sustainably sourced meats and produce. All of which is to say that the new incarnation of Zut shouldn't be all that different in concept from its predecessor — or, perhaps, from Eccolo, the much-mourned-over Italian restaurant that occupied the space before Zut!. The new restaurant will remain very casual ("like home cooking," Kamio said); it will still serve pizza and housemade pasta. The menu will be shorter than Zut! 's, but it should change more frequently. Kamio also plans to add an oyster bar to the mix. And he has hired Nate Gabriel, a Michael Mina veteran who most recently cooked at the seafood-centric Jack's Oyster Bar & Fish House, to be his chef de cuisine. Kamio told me that he wasn't necessarily looking to expand when the owners of Zut! reached out to him about the possibility of buying the restaurant. "If this place is fifteen miles or twenty miles away, maybe I wouldn't do it," he said. "But fifteen steps away, I can do that." For now, Zut! on Fourth remains open with its old menu, but Kamio plans to close the restaurant later this month for staff training and minor renovations. Zut Tavern is slated to open in the middle of July.